If you have a day or more to spare in Auckland and have a car, a thirty-minute drive in any direction will take you to the city outskirts. From there you will find some great things to see and do. Take the north-western motorway from the center of the city and head for Titirangi. This delightful little village is a great place to stop for a coffee at one of its several cafes. From there it is only a short distance to the Waitakere Ranges, a volcanic mountain range now covered in sub-tropical rainforest. Experience one of the many walking and hiking trails through here. Then be sure to check out the wild west coast. The string of beaches here presents a very different character to the calmness of the east coast. With pounding surf, black sand (which gets very hot in the summer), and large sweeping sand dunes this is a place where you feel the rawness of nature. The walking is wonderful here; the beaches are swimmable but with big seas and strong rips, always make sure you stay between the lifeguard flags. 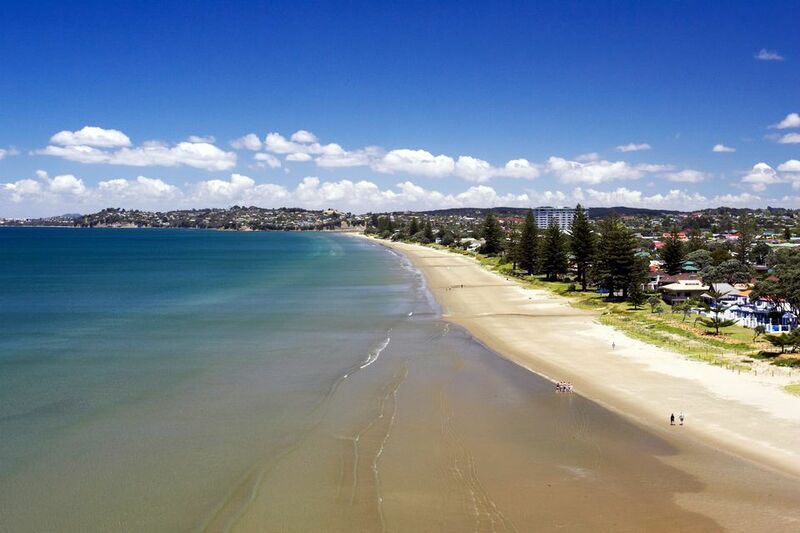 Twenty minutes north of the Auckland harbor bridge is the rapidly-developing Hibiscus Coast. The town of Orewa has one of the most beautiful beaches in the whole Auckland region and is well worth stopping at for a walk or a swim. Orewa also has some excellent cafes. Take the coastal route north, passing Hatfields Beach, Wenderholm Reserve (with another pretty beach), Puhoi (a charming settlement of Bohemian origins), and stop for lunch in the riverside town of Warkworth. From there the coast opens up to a string of lovely beaches and small settlements. Any of them are worth exploring, although highlights are the Tawharanui Peninsula and the Goat Island Marine Reserve near Leigh. A range of hills called the Bombays marks the dividing line between Auckland and the Waikato Region. On the Auckland side, there are a number of pretty towns such as Pukekohe, Waiuku, and Tuakau. Heading in a southwesterly direction brings you to the lower reaches of the Manukau Harbour and the Awhitu Peninsula. You won't find many tourists here; just a few locals happy to talk to you about the great fishing on the Manukau. Auckland's waterfront heading east from the city takes you along a string of lovely beachside suburbs. The first is Okahu Bay. From here be sure to visit Bastion Point Reserve; this area looks down on the bay and provides spectacular closeup views of the city, harbor, and islands. Next, there is Mission Bay, Kohimarama, and St Heliers, all lovely beaches in their own right. Just visiting these places could easily fill a day. However, if you wish to go a bit further, the road goes inland from St Heliers for a short while before meeting the coast again at the beaches of Bucklands Beach, Eastern Beach, Howick, and Maraetai. All are well-established parts of suburban Auckland. A little further on are the rural districts of Whitford and Clevedon and Kawakawa Bay. This is a lovely area for country driving through farms, vineyards, and lifestyle blocks. Rangitoto is the closest and also the youngest, being a volcano which erupted only about five hundred years ago. Although without a resident population there is a wonderful walk to Rangitoto's summit which will reward you with spectacular views back across the city. Waiheke Island, by contrast, is virtually a suburb of Auckland; you could easily spend a day here visiting the vineyards, cafes, and beaches. Other islands that may be visited include Motutapu (which is literally joined to Rangitoto by a causeway), Motuihe, Rakino, and Kawau. Ferry services to these islands can be infrequent. If you're wishing to visit them, boats can be hired from the viaduct area. Great Barrier Island is approximately fifty miles from the center of Auckland so the only practical way to make a day-trip visit is to go by plane. Great Barrier Airlines operates daily flights and also provides transport options while on the island.